Horseman‘s One Step® Leather Cleaner & Conditioner preserves and conditions leather to keep it soft and pliable, protects against drying and cracking, and leaves a beautiful satin sheen, all in one easy step. It comes in both an easy-to-use glycerin-rich formula Spray or lanolin-rich formula Cream. The non-aerosol micro-spray penetrates crevices to lift out dirt and grime without dripping, then dries fast so tack can be used or put away immediately. The fine mist provides even coverage and sprays from any angle, even upside down. The easy-to-use cream penetrates leather to release deep-down dirt and sweat, gently lifting it away, while the unique lanolin-rich formula also conditions and preserves to keep leather soft and pliable with no sticky residue. Use with adequate ventilation. Avoid eye contact. Contents under pressure: do not puncture or incinerate container. Store in a cool, well-ventilated area away from incompatible materials. Do not store in direct sunlight, in temperatures above 120F or near heat, open sparks or flames. See product label for first aid instructions. For Label Information and MSDS Sheets, please click on Manufacturer’s Information to the right. Have used it for 40 years. also great on furniture that needs a little wax. Handy for quick wipe-down when no time to clean with water and saddle soap. I have always done a 2 step when cleaning tack... clean with damp wet sponge and then used the traditional "bar" of saddle soap with sponge to clean my tack. So this was handy doing it all in one step. Tack looked good and not gooey or slimy or slick when I finished. 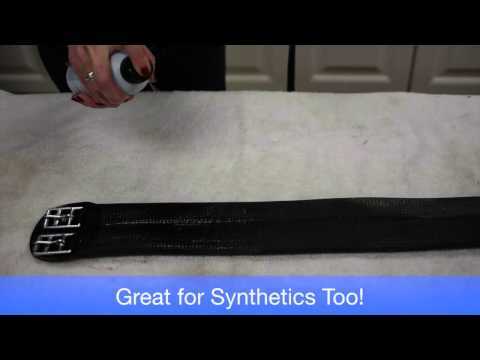 This product is easy to use and leather responds well to product. Easily absorbable giving leather immediate conditioning and , leather looks great after application . The product is not grease like other products . I got this to clean and condition my boots. It does a good job of cleaning and getting all the un-necessary oils off them. Easy to use cleaner. Doesn't leave a scum or residue. Gets tough dirt and sweat and leaves leather supple. Does tend to take off a bit of dye but not more than other cleaner does. I use on all my tack. Easy to use spray cleans and conditions in one step. Then buff to a shine. Softened an old bridle and my son uses it to clean and condition his work boots. It's easy to use. I've been using One Step for many years. I try other products at times - always end up back with One Step. It does a good job of both cleaning and conditioning leather. I've never had it discolor any of my tack. Recently tried it on my leather car seats and the results were great. I use this on both tack and boots and it's done wonders! Simply swipe and you're good, I don't wash it off. Pretty great product. Our favorite cleaner, and saves us an extra step in cleaning our tack for 4 horses! I have limited time to clean my tack and Absorbine Horseman's One Step works great for me. I simply do not have time to clean my tack like it deserves. I use the spray can of Absorbine Horseman's One Step to clean my tack just as I am taking it off my horse. Just a quick spray and wipe and my tack looks great and is kept in good condition. I live in a very hot area of the US. Summers here see most days above 100 degrees. Absorbine Horseman's One Step keeps my tack soft. I will definitely continue to use this product. Purchased in cream form and used it often on my saddle only to find the cream works better as a cleaner than an oil. If you apply too liberally it will leave a white film on your tack that is not easy to get off! The "Continuous flow aerosol cans" that Absorbine came out with are garbage. 3 Cans of 3 different products went into the trash full of expensive product because the nozzle worked 1 or 2 times and then only dribbled out after words. we use this product to clean our 1/2 chaps in the barn and it keeps them looking like new. Used it forever, very easy and a good price! Easy way to clean tack. Hope it is easy to use for quick clean between rides. To clean leather - trying as a new "one step" option. This product's price is substantially lower than other retailers, and I like the product! I needed something to spray on my saddle and bridle and just rub it in! Quick and easy! I actually chose the cream. Figure it is better than the spray as it will be more controlled. Does this come with the cream and aerosol? BEST ANSWER: The Cream: 15 oz is what is left to purchase, the spray was sold separately But the spray is not available at this time. how do I purchase the spray? BEST ANSWER: Absorbine no longer makes the spray, only the cream. they discontinued the spray a couple years ago. BEST ANSWER: At this time we only have the cream.